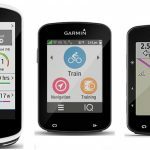 Here is a post that very clearly shows the differences between Garmin Edge 820 and 520. 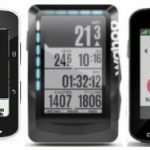 I start this post with a chart comparing all features of the Garmin Edge 820 and 520, and then I discuss the 9 key differences between them. Then I wrap it up with another chart that shows only the differences between the two bike computers, so you can see the key differences between the Garmin Edge 820 and 520 at a glance. Note: this post was updated after posting. Garmin often brings in new features with a new unit update, and then later updates the other units with the spanking new features. 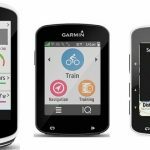 This happened with the Garmin Edge 820 – it came with a lot of exciting new features, and many of these have now been shared with the Edge 520 via software updates. 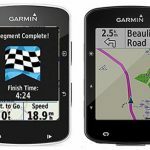 As a result, this post started its life as “9 Differences between the Garmin Edge 820 and 520 “, and is now “6 Differences between the Garmin Edge 820 and 520 “! As you can see, both of these Garmin Edge bike computers have tons of features, and are in fact very similar. Both are optimized for bike training, and both are premium, rugged bike computers. Both can be paired with an impressive range of sensors. They are identical in size, although the Edge 820 is very slightly heavier. Both have color screens. Interestingly, the Edge 510 had a touch screen, and the Edge 520 reverted to buttons. Apart from that, the 520 was a massive upgrade on the 510. Garmin never said why it went back to the buttons on the 520. 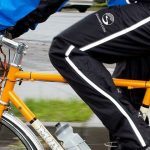 However, it is a known fact that some users have complained of problems with the touch screen when using Garmin Edge bike computers in the rain. The Edge 820 will give you turn-by-turn navigation instructions to a saved address or an address you have just requested. Or to a cycling-specific POI (point of interest). For example, it will alert you of an upcoming turn with a beep, and if you look at it, you will see text saying something like: “Turn right on Main St in 50 feet.” If you miss the turn, it will beep at you quite manically. However, if you ignore that, it will recalculate the route. The Garmin Edge 820 was the first Garmin Edge bike computer to offer the GroupTrack feature. 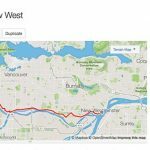 This lets you pair your device through Garmin Connect with other people’s compatible devices, so you can see where your riding buddies are, right on your bike computer screen. 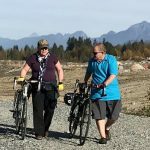 This could be handy if, for example, your wife leaves you in the dust and you need to try and catch up (yes, this has happened to me – thanks, Mrs. Average Joe Cyclist)! To me, this was the most useful new feature on the Garmin Edge 820. If you are worried about losing battery power, just put the bike computer into battery save mode. The screen will blank out, but it will keep recording your ride. You can bring the screen back to life at any time. This extends the battery life by several hours. The Edge 520 does not have this feature. So, those are the 6 key differences between the Garmin Edge 820 and 520. There are other minor differences: for example, the 820 will store 200 hours of history, vs 180 hours on the Edge 520. Here are all of the differences, handily summed up in this chart. This is basically the chart at the top of the post, edited down to only the rows that have differences. 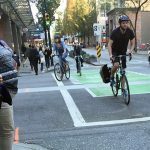 Either one of these bike computers is excellent if you jut want to train smart with a premium bike computer. However, if you want great maps and route calculation and navigation then the Edge 820 is certainly the right choice. Also, a key issue is whether you prefer button control or touch screen control. If you prefer buttons, the Edge 520 is for you. If a touchscreen is a must, you will be happier with the Edge 820. Note: if you do decide to go with the Edge 520, Amazon’s bundle deal is good, offering the Edge 520, a heart rate monitor with a premium strap, a cadence sensor, a speed sensor, and an extended out-front mount and a standard mount, for about a hundred dollars more than the base Edge 520. Buy it from the Online Retailer of Your Choice!